VE's Fantastical Nonsense: What have you done to your Co-Worker lately? What have you done to your Co-Worker lately? Hey, let's start a little blog collection here. How about everyone comment on their favorite prank on their cubicle co-worker(s). Come on, you know you're out there and your damn creative too. Of course, since I'm sure I write a blog that nobody reads anyway, it'll be a small collection of creative suggestions. But who knows, prisoners in minimum security lockups might just be bored enough to wander onto my blog. Hey, trying to see the cup half full here, ok? 1. Our co-worker had a bit of a bathroom remodeling project nightmare that she shared with us awhile ago. Being the caring group we are, we waited until she was on vacation for a week and proceeded to turn her cubicle into a full fledged bathroom. We had a toilet, a mirror, tile layed down (ok, it was merely placed there but it looked damn good), a shower rod and curtain over the front, the bowl scrubber, the plunger, and about every little detail right down to the floss and Q Tips. A work of art for sure. 2. Try putting a piece of perfectly fitting black construction paper over a monitor that has one of those glare protectors on them. Desktop services will be trying to figure out what happened for hours! Great simple entertainment! 3. Remember reading about the fad where College students tried to see how many people they could get into a phone booth? See how many chairs you can get into an office and still get the door closed. We managed to get 54. 4. Somebody with an office that has windows into it? Here's a good one: Using large sheets of paper, essentially create a "pocket" around the entire window areas by taping the paper around them and then filling up the pocket with that hideous white popcorn packing. By doing this, you creat the illusion of the entire office being filled to the ceiling with those things but will probably avoid you from actually being fired when they discover that the office is actually still usable. Bonus touches are to break up a few of them and have them sort of leaking out from under the door. 5. If you are particularly vengeful and aggressive, an open container of milk placed strategically behind a filing cabinet or somewhere else very out of the way is an amazingly simple but effective payback for that incessant prankster in your group. Just be sure you don't have to sit very close to them. 6. 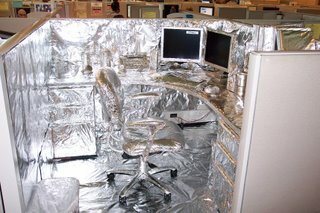 A lot of anything is an excellent way of augmenting to the cubicle or office décor. We found out a co-worker wasn’t very fond of Glen Close once. We took a picture, reduced it to about a 1x2 inch size, replicated it as many times as possible on a sheet of paper and then proceeded to make copies. Lots of copies. Then the fun part; finding the most ingenious places to hide them. They were everywhere: inside the stapler when he had to refill, in book, folder, under things, taped behind things. You name it, we probably thought of it. Mouse ball doesn’t work? I wonder why! Yes, even though it has been over 7 years since that event, he’ll still call up and proclaim that he found another. 7. During one of our numerous office moves we once took my bosses boxes and hid them. What made it a lot of fun was that we found a pad of official memos for the facilities department (those in charge of moving employees). We created a whole bunch that apologized for the mix-up and that his boxes where in such and such place instead. He’d go there and there would be yet another memo. We bounced him all over the building until he finally discovered his boxes were in the women’s restroom. He wasn’t too thrilled asking for one of the females to bring his boxes out. 8. Themes are classic. The tin foiled cube, the shrink wrapped cube, how about an upside-down theme; that one is fun. 9. I once had a huge white board that had all my plans on it. Everyone knew that was the master planning whiteboard and was the sacred lifeblood of the project. I came in one day to find it completely erased and cleaned. Of course, my stomach did knot up until they revealed that they didn’t erase it, they had merely taken the entire white board out of the office and replaced it with an empty one. Very cruel, very cruel indeed. 10. God forbid that you ever leave voice mail. I can’t tell you how many times they’ve taken somebody’s awkward message or stupid laugh and put it on every computer in the area and then played them all simultaneously as that poor person walks into the area. At one time my boss had a tiny office with no windows, so tiny that the desk fit in with barely enough room for him to squeeze by it. I got everyone's coats in the branch and put them on coat racks that I had gathered up, so when he opened the door all he saw was hanging coats. We also put a broom in there. Joke was on me because a year later that was my office. An obnoxious girl at work got one of those boxyScions and just bragged and bragged about it. Everyone hated her so someone suggested it looked like a toaster and it made her so mad that we kept on. When that finally died down I got a package of poptarts and attached it to a key ring, left it on her desk with a note saying "Congrats on the new car, here's a key chain from all of us!". She was livid. Then a few days later someone left a toaster on wheels on her desk. She got extremely mad at that one and talked to her supervisor. We let it go at that but no one ever figured out it was me that left the keychain.